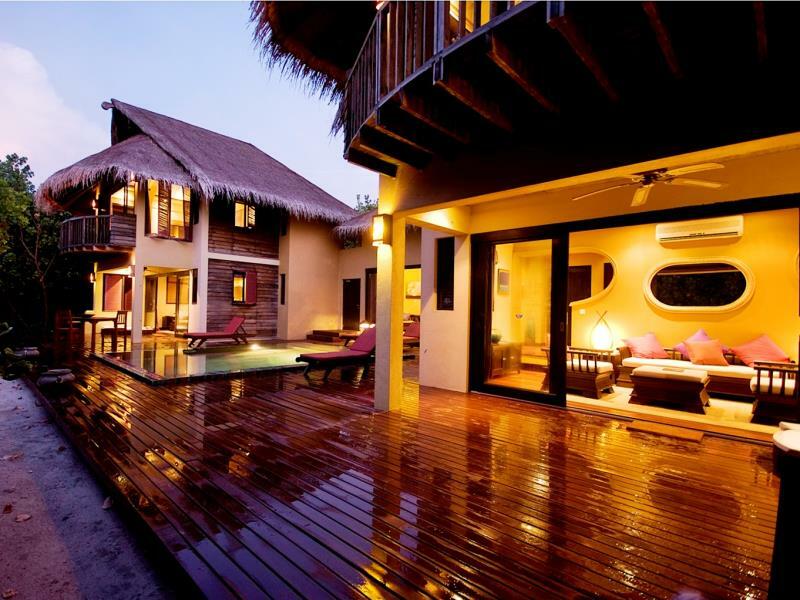 Fit for any modern day Sultan and secluded amidst lush tropical vegetation is the Ganduvaru Suite. Inspired by Sultan Mohammed Thakurufanu’s Palace on the island of Utheem, the Ganduvaru Suite is the abode of choice for those desiring ultimate comfort while not skimping on privacy. Sultan Mohammed Thakurufaanu is, to this day, celebrated as a national hero – one who freed the Maldives from the long torment of foreign dictatorship and ruled over the country as sultan. Featuring its own private plunge pool, thatched roofs, ocean view terraces and spacious living area the suite offers ample space for family meals and get-togethers. With two bedrooms, each with attached open plan bathroom with shower and Jacuzzi the Suite also has a pantry and butler’s quarters. And in-villa spa treatments are just a booking away. Floor area: 300 square metres. With panoramic views of the ocean, the Beach Villa interiors are heavily influenced by traditional Maldivian craftsmanship incorporating timber floors and traditional thatched roofs. 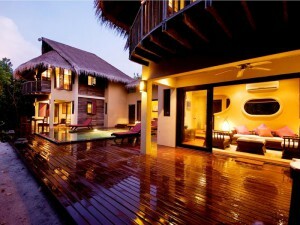 The Beach Villas feature a connecting lounge and an open veranda with Jacuzzi. Floor area: 96 square metres. With exquisite views of the sea, the spacious two level Duplex Beach Villas feature high, traditional Maldivian thatched, ceilings – allowing the smooth cooling sea breezes to flow through and invigorate your soul. The cozy ground floor lounge would seem like home if not for the breathtaking view of the crystal clear waters stretched out before you. 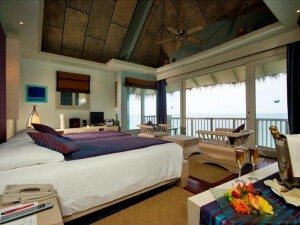 The upper level bedroom features am attached bathroom and a timber decked balcony – your gateway to ocean gazing tranquil. In-villa spa treatments are just a booking away. Floor area: 136 square metres. Built almost completely over the sea, the Ocean Villas are reminiscent of a luxury yacht – dip your toes into the ocean as you admire nature’s aquarium below you. The salt tinged fresh air will sooth mind and body as you leisurely gaze across the horizon at the neighbouring islands. On the upper level; slumber on your bed or choose between taking a soak in the open-plan bathroom hot tub or the Jacuzzi situated on the veranda. In-villa spa treatments are just a booking away. Note: As safety precaution families with children under 12 are not recommended to take up accommodation in a Duplex Ocean Villa. Floor area: 147 square metres.